Say no more. 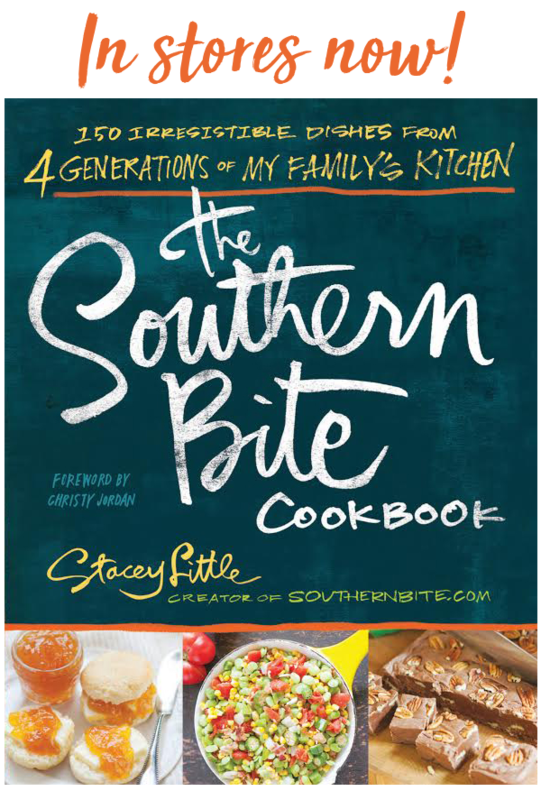 Southern Bite to the rescue! 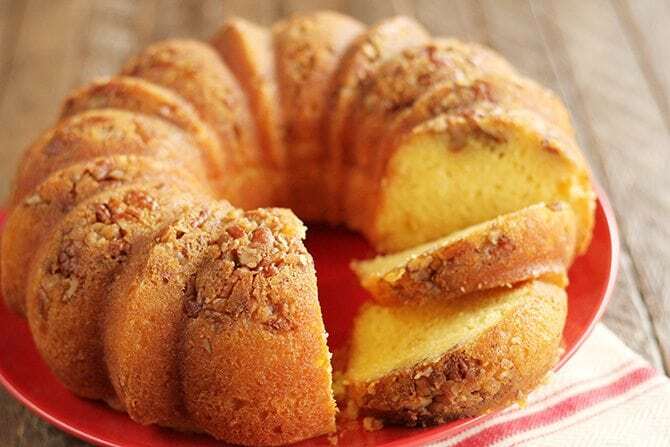 This super easy Rum Cake is the perfect easy holiday recipe. I found it in an old community cookbook years ago and have been using it ever since. It starts as a cake mix, but ends up in rum cake perfection. 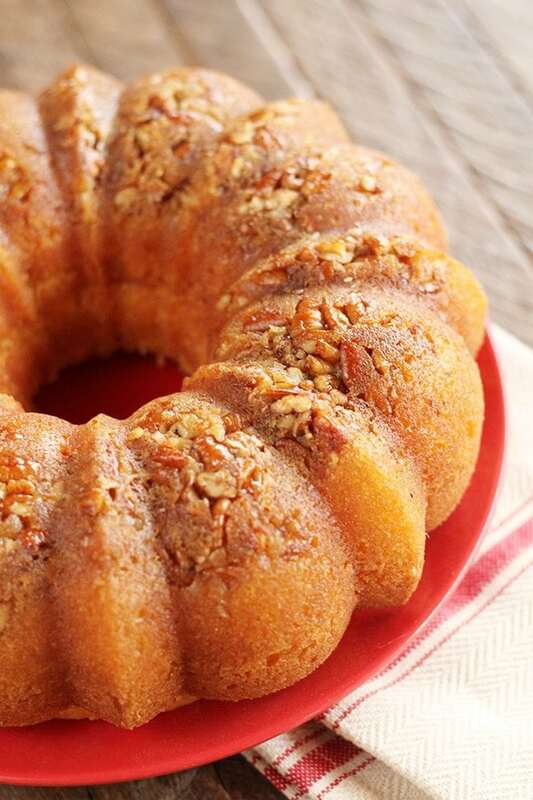 What really makes this delicious, as with any rum cake, is the delicious rum glaze. But somehow, it’s not too rummy. I mean, if rummy cake is your thing, you could always add more rum to make it, you know, more… rummy. But that’s up to you. 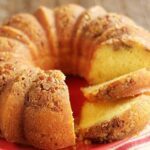 So, if you need a delicious homemade gift for someone (or just a great tasting cake for yourself), this Cake Mix Rum Cake might be just the ticket. Y’all enjoy! Preheat the oven to 325°F. Grease and flour a Bundt pan with at least a 10-cup capacity. Sprinkle the pecans in the bottom of the pan. With a mixer, mix together the cake mix, pudding mix, eggs, vegetable oil, water, and rum. Continue mixing until well combined. Pour the batter over the pecans. 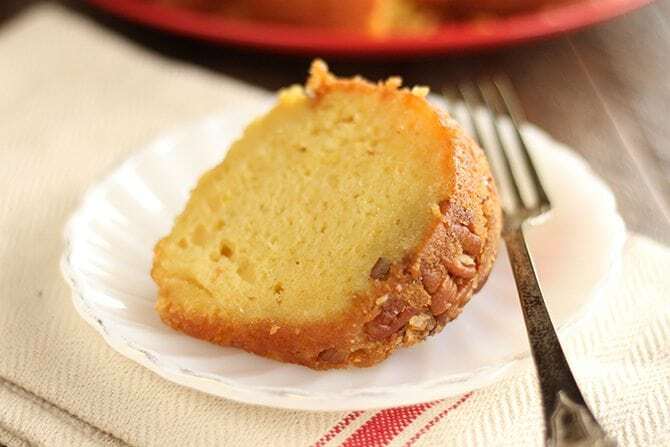 Bake for 50 to 60 minutes, or until a toothpick inserted into the middle part of the cake comes out clean and the cake starts to pull away from the edges of the pan. Make the glaze by combining the butter, sugar, and water in a small saucepan. Bring to a boil then remove from the heat. Stir in the rum. Pour over the warm cake while it is still in the pan. 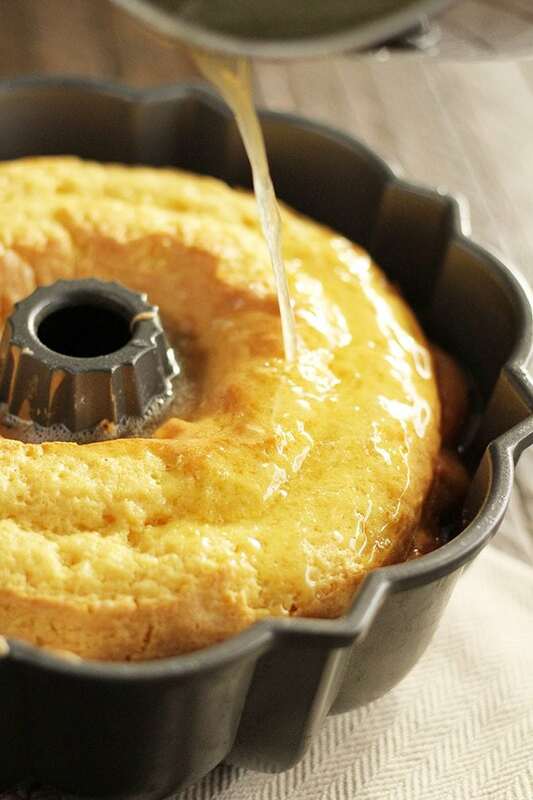 Allow the cake to cool before removing from the pan. correction – Merry Christmas to you and all your loved ones! I have made this same cake several times!! It is loved by all! Merry Christmas and I must say, so glad I recently found your site! I am so enjoying it! I used to bake these as Christmas gifts. Wow – this brought back memories. I’m going to make one for Christmas this year! Wonder how it would be with bourbon?!?!?! LOL! I’d love to get this as a gift! 🙂 Bourbon! Yes! Oh and Merry Christmas, Happy Holidays and all that good stuff. Make this your best holiday ever! I sometimes use Amaretto! Talk about Yummy!! I have been making this cake for years , and I always brought it to any family gathering for Christmas. 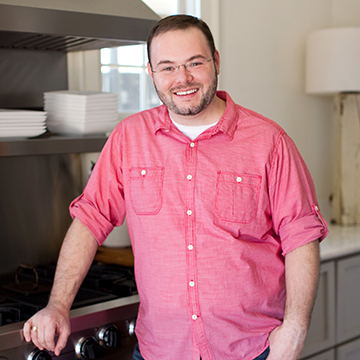 Everyone always loved it, including my dear Mom, and it’s so easy to make that it’s almost foolproof. One year an aunt of my husband’s requested me to make her 3 of these delicious Rum Cakes, and she gave one of them to her son who was in visiting from Iowa to take home with him. Although I never used white rum, specifically. I always had dark rum on hand, and so that’s what I have always used. I’m not sure whether or not it really matters. In 1980 I was in Switzerland. There I had a good cook who has made this cake. We liked it very much. Thank you very much for the receipe! Have for you and your Family aMerry Xmas and a very happy New Year! This recipe has been a favorite of mine for at least 20 years. Always well loved wherever I take it. Using the dark rum, however, does give it a much better taste. For the glaze too. I used Bacardi dark rum up until two years ago as the original recipe was Bacardi Rum Cake. Now I use Appleton Estates dark rum. Such a smooth and “buttery” difference in taste. I switched at the suggestion of a blogger…so glad I did. Years ago I made this cake with Brandy. It was amazing! Yum! I love a good rum cake, especially one that’s easy to make! I am making this for Christmas. I don’t have any plain rum on hand but have coconut rum. Do you think it will be OK? I think that would be just fine! Can this recipe be made in a slow cooker? Hmmm… I can’t say I’ve ever tried that. I am making this for the first time and wonder if sugar free pudding will make a difference and which should be used the 1 oz or 1.5 oz of sugar free? I have eaten this cake and love it- but this will be the first time I make it! I’ve not tried it with sugar free pudding mix, but the equivalent to the size of the regular pudding should be the 1 ounce packet of sugar free. If you do try it, please let me know how it turns out! 🙂 Enjoy! I have made this cake for years… my secret to a fabulous, tummy cake is #1) I use heavy whipping cream instead of milk 2) I used spiced rum. In the glaze… NO WATER! All Rum and I use brown sugar, not granulated…. this recipe has a velvety texture that is very rummy…. it’s always gone the same night I bake it!!! And it’s an annual gift for special friends! Happy Baking! Thanks for the tips, Susan! my cake fell after taking it out of the oven. I followed the directions to a tee. What could have caused that? There are a variety of things that could cause it… undercooked cake, expired cake mix, incorrect oven temperature, improper mixing, etc. Sorry to hear you had trouble! I’ve made this for many years and it’s always a hit! The original recipe actually calls for Bacardi Gold rum and that’s what I always use as it seems to offer just the right flavour. I’ve enjoyed reading the other tweaks that people have made. The last several years, I’ve also added shredded, unsweetened coconut to the bottom of the pan with the pecans and everyone has enjoyed this flavour addition as well. I’ve even baked this in mini loaf pans and have given these as gifts. A very versatile recipe indeed! Ha! Glad everyone enjoyed it!! I have used this recipe in the past. In fact over 20 years ago. I made it again two years ago at the request of my son. I was concerned that the cake mix has changed from 18 1/2 oz to 15.25 oz. . I tried adjusting the recipe . It came out good however too much trouble and waste. I now ignore the fact that 18 1/2 oz has changed to 15.25 oz and it was just as delicious. I will be making it again for Christmas and probably for New Years as well. Always a big hit. I friend of mine made this for our christmas party at work and I just have to try it. Do you think a cognac like hennessy would work? I do think they will work, but will change the favor a bit. I just made your cake, it turned out awesome. The only issue is I made too much rum sauce. I didn’t want to soak the cake with it so… How do I store it? The sauce is so delicious I refuse to throw it away. What else can I use the sauce for? I need some suggestions for future references. This is exactly like my mother’s recipe, except she always used Myers’s Dark Rum. I’ve tried it with both dark rum and light rum, and dark rum definitely gives it better flavor. I also think that the addition of vanilla pudding is a holdover from several decades ago, and with the “supermoist” mixes that have been around for the past few decades, adding pudding isn’t really necessary.